I’ve been testing out different cast iron skillet recipes over the last few weeks and I am hooked. 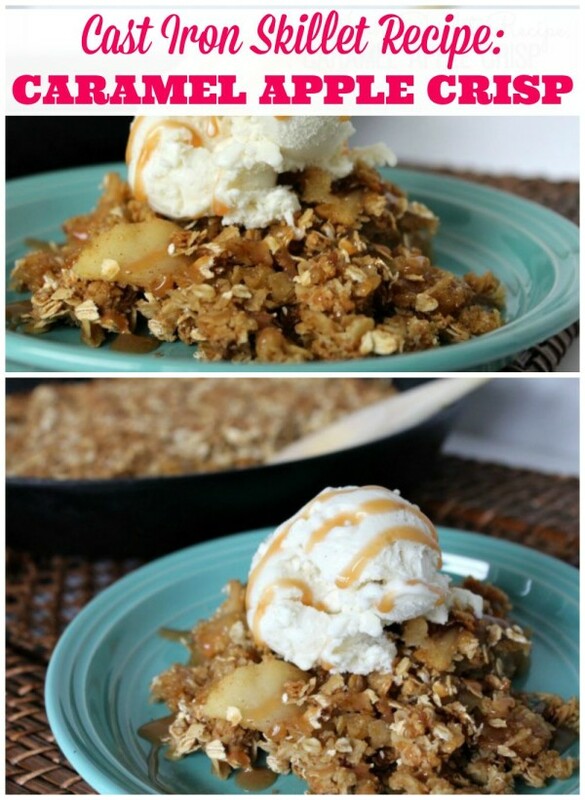 One of my favorite desserts I’ve whipped up in it is a Caramel Apple Crisp. I still like making the individual ones in my ramekins, but there’s magic in a cast iron skillet. Something happens to your food while it’s cooking in there that you just can’t get any other way. 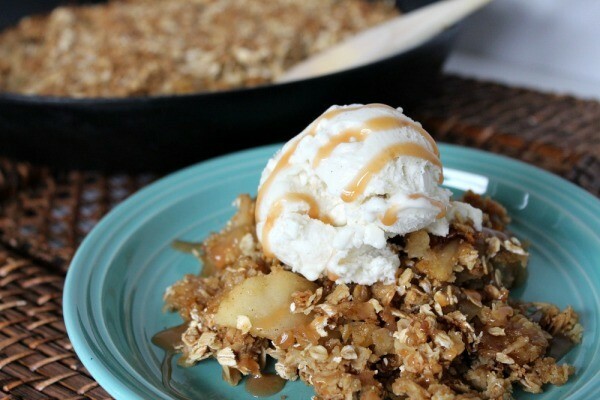 If you’re looking for a dessert that is easy, takes 30 minutes to whip up and just tastes amazing – this apple crisp is for you. It’s perfect to serve to guests or to fix for your family on a night everyone has a sweet tooth. It takes about 30 minutes to bake, so stick it in the oven while you’re eating dinner and after you’re done, dessert is ready. 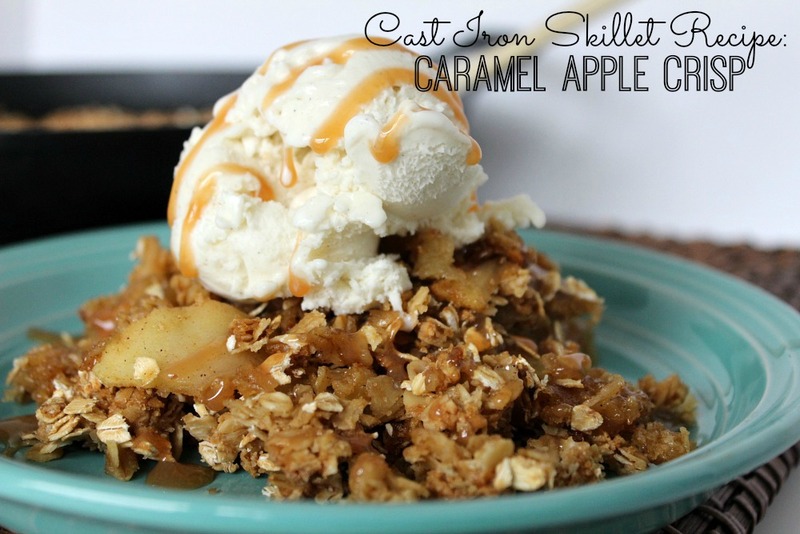 Top it with vanilla ice cream and more caramel if you wish. It’s ultimate comfort in a bowl. A warm, comforting, easy to prepare dessert that will satisfy everyone's sweet tooth on a cold night in. 2. Prepare topping by combining the softened butter, rolled oats, brown sugar and salt. I use my hands or two knives. Set aside. 3. Melt the other 1/2 stick unsalted butter in your cast iron skillet. Add the brown sugar and cinnamon and stir to combine. Add the sliced apples and stir until all of the apple slices are coated with the mixture. 5. Pour the caramel sauce over the apple mixture. I use the squirt bottle kind. 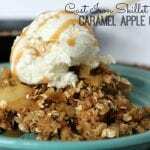 You can leave this step out if you do not like/want caramel in your apple crisp. 6. Sprinkle your topping all over the apple mixture, making sure it's covered evenly. 7. Bake in your 375 degree F oven for 30 minutes, or until apples are tender and topping is golden brown. 8. Serve with ice cream, whipped cream and/ or more caramel sauce if you desire. What’s one of your favorite cast iron skillet recipes?